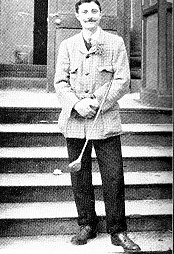 Thomas George Renouf was born in Jersey in 1874 and, like fellow Channel Islander Harry Vardon, earned his living as a professional in the north of England. He began at Roundhay in Leeds in 1896, moved to Shipley the following year then crossed the Pennines to Carlisle. He was here until 1906 when be began a twenty three year stint in Manchester. This seems to be the period when he devoted most time to clubmaking, producing models like the "Superb" driver with steel and ivory face inserts. He was a consistent performer in the Open Championship finishing in the top 30 every year, bar 2, from 1897 until 1911.